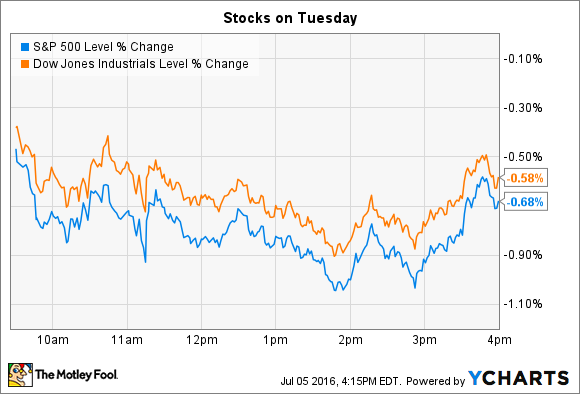 Big news for shareholders put these stocks in focus as indexes slipped on Tuesday. Stocks fell on their first trading session since concluding their best weekly performance of the year. On Tuesday the Dow Jones Industrial Average (DJINDICES:^DJI) gave up 109 points, or 0.6%, and the S&P 500 (SNPINDEX:^GSPC) lost 14 points, or 0.7%. The energy sector was the market's worst performer, slumping as crude oil prices fell by 5%. Individual stocks making headlines on Tuesday included streaming-video giant Netflix (NASDAQ:NFLX) and electric car producer Tesla Motors (NASDAQ:TSLA). Netflix shares briefly passed $100 following news that it reached a deal with Comcast (NASDAQ:CMCSA) to integrate its streaming video service into the cable titan's X1 set top box. In a joint statement to Recode, Comcast and Netflix said that they aim to provide "seamless access to the great content offered by both companies" through the arrangement. The new functionality is slated to launch later this year. Netflix could see a decent subscriber boost from this deal given that 8 million Comcast cable subscribers already have an X1 box at home. That number should only increase as the company works to raise the device's penetration from the current 35% level toward 50% over the coming quarters. We don't have any details on terms, but this tie-up looks like a win for both companies. As for Netflix, CEO Reed Hastings and his team get to put their service in front of a big pool of potential subscribers while making it easy for them to sign up without needing to buy new hardware. That would only help membership growth, which is slowing in the U.S. right now. Comcast will likely get a nominal financial payoff for the new members it helps create, but more importantly it will improve the experience on its X1 set top box and give customers one more reason to upgrade. Tesla shares briefly fell by as much as 4% before recovering to end the day with minor losses after the electric-vehicle manufacturer missed its delivery guidance for the second straight quarter. Tesla produced just over 18,000 vehicles in Q2, the company said in a weekend press release, and delivered 14,000 to customers. In May the company had forecast producing 20,000 vehicles while delivering roughly 17,000. Tesla blamed a production pace ramp up that didn't occur until late in the quarter for most of the shortfall. An unusually large number of vehicles were also in transit to customers at the close of the quarter, which only means that Q3's delivery numbers will get a boost to the extent that Q2's figures were depressed. Tesla investors can use this news as a reminder that CEO Elon Musk and his team can't be as precise about delivery and production figures at this early stage of the game in the Model X rollout. Long-term goals like its 500,000 vehicle production pace should also be viewed in that context. The good news is that Tesla's production ramp is a reality. The company aims to deliver around 50,000 vehicles over the next two quarters, which is equal to its sales pace through all of 2015.